I’m pretty sure I booked my ticket for the Vivid Keynote the day the schedule was released this year. I got my first Johnny Cupcakes t-shirt as a gift in 2006 and the brand has been on my radar since then. They’ve developed a bit of a cult following over the years, proving they are more than just a t-shirt company. 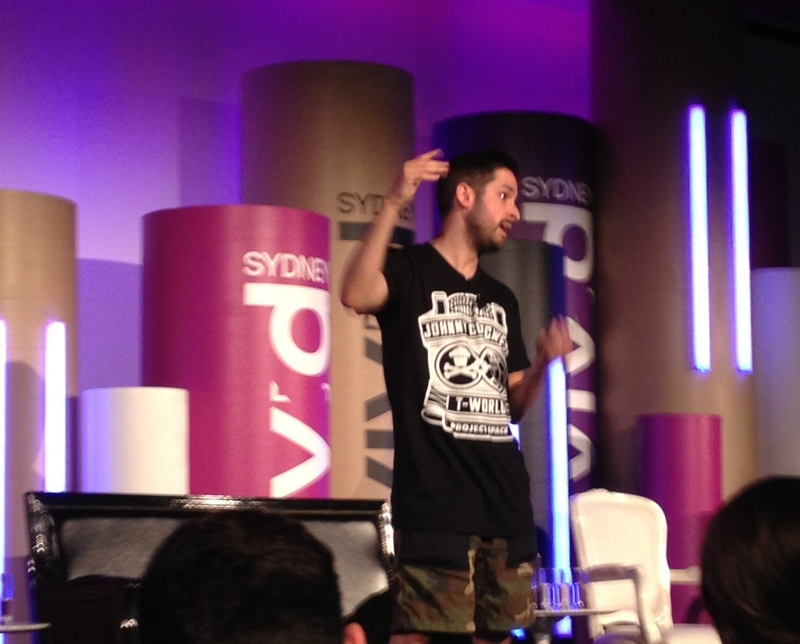 Fans of the brand have gotten Johnny Cupcakes tattoos (I even saw a few in the audience during the talk at the MCA). Johnny Cupcakes (aka Johnny Earle) started the company operating from the truck of his car, selling t-shirts on the road while touring with his band. The company has now grown into a multi-million dollar business with physical store in multiple US locations and now London, in addition to the online shop. His keynote at Vivid told the story of his journey as a young entrepreneur and the steps that led to starting his company. He also shared some lessons in business that he believes has helped Johnny Cupcakes grow and become a success. 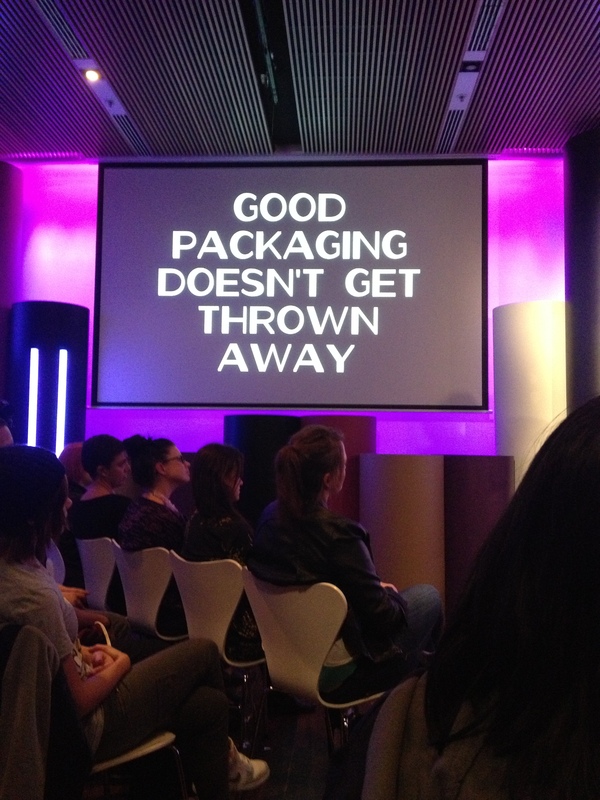 I walked away with two main themes that really stuck with me from his talk. A point that Johnny made several times was the importance of reinvesting profits into the company. When he was in school he used to buy items like prank toys (i.e. whoopee cushions) and candy bars to sell to his classmates. It sounds pretty trivial until you find out that he was moving about 200 packs of candy per day and making approximately $1,000 in cash that, in the words of Johnny, “the government didn’t know about.” As a young kid it would have been easy for him to spend that type of cash, but he didn’t, he reinvested. He went to the shop and bought more candy or prank toys and was thinking about what was next on the agenda. He did the same with Johnny Cupcakes, on a slightly larger scale. He talked about how he made his first million by age 24, but he wasn’t rich. He claims he did and still does probably have a similar looking bank account to many people in the room because he always believed in putting back into the brand he built. Johnny said he gets approached by 50+ young people every day who say they want to start their own t-shirt brand. He thinks it’s great and encourages them to go for it, but does give the advice that they need to consider their own unique positioning. There are thousands of t-shirt brands out there, but what will make yours stand out. Fans camped out for 24 hours waiting for the Johnny Cupcakes London shop to open, and that’s certainly not something that happens for just any t-shirt store that decides to open. I’ve been to a couple really good talks recently that spoke to the important role that “non-scalable” activities can play in startups. There is so much hype and talk around things like growth-hacking and automation or spending your time figuring out how to maximize output and minimize input in business. So it’s really refreshing when you have someone like Johnny who stands up and talks about how he still writes hand-written notes in customers’ orders some days from the store. Johnny said details like the packaging were always important to him. It needed to be special and up to certain standards to delight the customers, even if it meant loosing money or a lower profit margin. He wanted to sell his t-shirts in packaging that didn’t get thrown out, and cited Apple as another company who does this extremely well. Another great story came from when they were looking to build and open their store in LA. Johnny stressed how important it was to create a store that didn’t just sell clothing, but created an experience when you visited it. They hired the same design team that had worked on clients such as Disney in the past to help create the new LA shop. They built fake ovens into the wall that opened and closed by themselves and released fake steam. They spent $700,000 on those ovens (and they weren’t even real ovens) that took them well past the original $60,000 budget for the entire store. However, in the end that risk paid off, and the Johnny Cupcakes brand continues to create an experience for its fans. Today is the final day for the Johnny Cupcakes Pop-Up Shop in The Rocks. Otherwise, you can check these guys out online at JohnnyCupcakes.com to get your sweet fix.